The Oaks Goldsbrough Apartments on Darling Harbour have a Sydney fridge location that places it close to the Star City Casino, Sydney Aquarium, Sydney Convention Centre and the many shops and restaurants in Darling Harbour and the CBD. The Oaks Goldsbrough Apartments has a magnificent neo-classical facade originally built in 1883 and offers travellers a charm reminiscent of Sydneys colourful past. All types of travellers can take advantage of the discount accommodation at the Oaks Goldsbrough, as well as the range of modern amenities including faxing facilities, guest laundry, gym & fitness equipment, lift, sauna, secretarial services, spa, outdoor swimming pool, tour desk, indoor pool, security, 24 hour reception and daily housekeeping. The magnificent classical facade, ironbark columns and original wooden floors complement the modern luxury that is displayed inside the apartments. The Oaks Goldsbrough Apartments Sydney combines the outstanding facilities and service of a modern luxury apartment hotel with the privacy and space that you would expect from a fully self contained apartment. 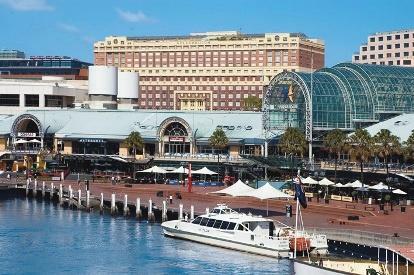 Nearby Attractions : Darling Harbour is a 2 minutes walk away, Airport 30 minutes by car, Central Station 10 minutes by car, Central Business District 6 minutes by car, Chinatown 5 minutes by car and Circular Quay 8 minutes by car. 1 Bedroom Apartment : Sleeps up to 4 guests on 1 Queen Bed + 1 Double Sofa Bed Extra..
1 Bedroom Harbour View : Sleeps up to 4 guests on 1 Queen Bed + Double Sofa Bed Extra..
2 Bedroom Harbour View Apartment : Sleeps up to 6 guests on 1 Queen Bed & 2 Single Beds + Roll Away Bed Extra..
2 Bedroom 2 Bathroom Apartment : Sleeps up to 6 guests on 1 Queen & 2 Single Beds + Double Sofa Bed Extra.. Studio King/Twin Apartment : Sleeps up to 2 guests on 1 King Bed Or 2 Single Beds.